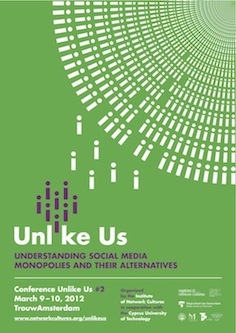 The conference ‘Unlike Us #2 – Understanding Social Media Monopolies and their Alternatives’ was held in Amsterdam March 8 -10, 2012. This report is an overview of the key results, the program and all the blogposts written about the project. Moreover, an overview of the budget is included. Part of the file is in Dutch, like the list of key results, nevertheless, all blogposts and the program is in English. The conference functions as a clear overview of the research done about the topic of social media and summary of the conference Unlike Us #2. Report is available as pdf.